Anniversary clocks are the modern 1st anniversary gifts. In addition to being great ideas for first wedding anniversaries they are equally perfect to celebrate any number of years together, whether married, engaged or simply to celebrate your love. Buy your special clock from the wonderful selection below and wish someone a truly Happy Anniversary. They're an excellent choice as a decoratively useful general gift too. Anniversary clocks are a special type of timepiece whose movement is controlled by what is known as a torsion pendulum. Rather than the back and forth tick-tock style, a torsion pendulum is a weighted wheel with metallic balls which are usually ornately decorated. This wheel rotates whilst suspended on a thin wire or cord which is referred to as the torsion spring. As the wheel rotares, the energy is effectively stored in the twisting spring, to a point where the spring eventually has enought energy to slow down, then reverse the direction of the rotating pendulum. The process then begins again, with the spring first releasing its energy until the twist has gone, then, as the rotating pendulum continues to rotate by its own momentum, storing the energy in the reverse-direction twist. The idea of the torsion pendulum itself was first patented by the inventor Robert Leslie in 1793, but the 1st actual torsion pendulum clock was invented and patented by Aaron Crane in New Jersey, USA, almost 50 years later in 1841. The Anniversary clock started ticking here - or umm, rotating. The torsion pendulum design allowed these timepieces to run far longer between 1st winding and the next wind, as a result of the fact that the slow rotation of the pendulum uses a very small amount of energy. In 1852 Silas B Terry from Plymouth in Connecticut, USA obtained a patent for the idea of a torsion pendulum marine clock. Silas was the son of Eli Terry who was famous for being considered as the first person to mass produce clocks in the USA. Silas formed the Terryville Manufacturing Company and built a new factory at Pequabuck, Connecticut, where he became the manager. Although the torsion pendulum marine clock's were successfully produced, only few were sold. Silas remained manager at Terryville until selling his interest in the company in Autumn 1854, when he returned to his own shop. Sadly, Silas went bankrupt in 1859, causing his shop and assets to be disposed of. Undefeated and undaunted, Silas became manager of W.L. Gilbert & Company's clock movement department in Winsted, Connecticut for around 2 years, after which he moved to Waterbury in Connecticut where he was similarly employed. With his superlative skills as a designer and clockmaker, it appears that working for someone else was not what Silas was truly intersted in, and in 1867 he created a new concern named the Terry Clock Company with his 4 sons at Waterbury. Although the company was able to obtain patents for a number of ideas, it suffered from a severe lack of capital, and after Silas' death in 1876 ,his sons were only able to keep the business running until May 1880 when the dread hand of bankruptcy struck once again. Three of the sons were taken on by an investment group from Pittsfield who took over the bankrupt business, keeping the name of the Terry Clock Company, but the business went under and was taken over in 1888 by creditors who renamed it Russell & Jones Clock Company, and ran the business for around 4 years. A separate torsion clock invention was patented by Anton Harder in Germany around 1880 to 1890, which is effectively where the idea started to take off in a serious way. The idea of using this torsion energy to keep a clock powered was first engendered in Anton Harder's mind by observing the continuing turning motion of a suspended chandelier after a servant had rotated it to light its candles. From this "light" of inspiration, he proceeded to conceive a clock which would run for a whole year between windings, a factor which would later inspire the name of Anniversary Clock. Anton Harder formed a company known as Jahresuhrenfabrik, which means "Factory of the Year Clock", but back in those days his clocks were far less accurate than today's modern timepieces. The patent was sold by Jahresuhrenfabrik in 1884 to another company, F.A.L. deGruyter of Amsterdam, who subsequently in 1887 let the patent expire, allowing other enterprises to begin serious production of torsion clocks. The actual name of Anniversary Clocks was first applied to torsion clocks in 1901 by the Bowler and Burdick Company of Cleveland, Ohio in America. They gave the timepieces this appellation due to their ability to run for 40 days between windings. As such, the clocks effectively could be wound once a year on a special day like a wedding anniversary. Bowler and Burdick were actually able to obtain a patent on the term Anniversary Clock at that time. The clocks increased in popularity, particularly as wedding gifts to be first rewound on a 1st anniversary, and also as actual 1st anniversary gift ideas. After the Second World War and the associated scarcities of everything from food to materials of all kinds, these clocks were one of the first types to return to production. Soldiers returning from the the ravages of the battlefield were able to bring them back from distant european lands as a particularly special gift for their loved ones, thus enhancing their romance even further. By 1953 around 13 companies made their own individual design of anniversary clocks but this declined to around 5 by 1965. Due to their finely made compenents, the clocks broke down easily and replacement parts were expensive and difficult to find. Modern technology was about to come to the rescue however, with an additional bonus too. As well as their delicacy, since their 1st invention, the one other main drawback with torsion clocks was their lack of accuracy. With the advent of battery powered movements and quartz technology, the modern anniversary clock has taken a quantum leap forward in accuracy and reliability. Now, rather than give a winding each year, each anniversary can be celebrated by invigorating the clock with a fresh supply of batteries, ensuring its energy continues until the earth rotates around our sun once more and the next anniversary can be enjoyed by a happy couple. A bundle of exquisite sleek flowers make up this artificial calla lily arrangement. The blooms peek out of a modern rectangular vase and the stems of these realistic lilies swoop into a pool of faux water. This arrangement looks lovely solo but put this piece on your mantel next to an anniversary clock or a much loved family photo for a put-together look. Howard Miller - Mantel / Table Clocks - 645690 - For over 70 years, Howard Miller has understood the require to create products that are steeped in quality and value and to never expect anything less than the best. No matter the price of the buy, you have Howard Miller's assurance of quality that is reflected in both the products they create, and in the people whose artistic talents they rely on to manufacture them. Incomparable workmanship. Unsurpassed quality. 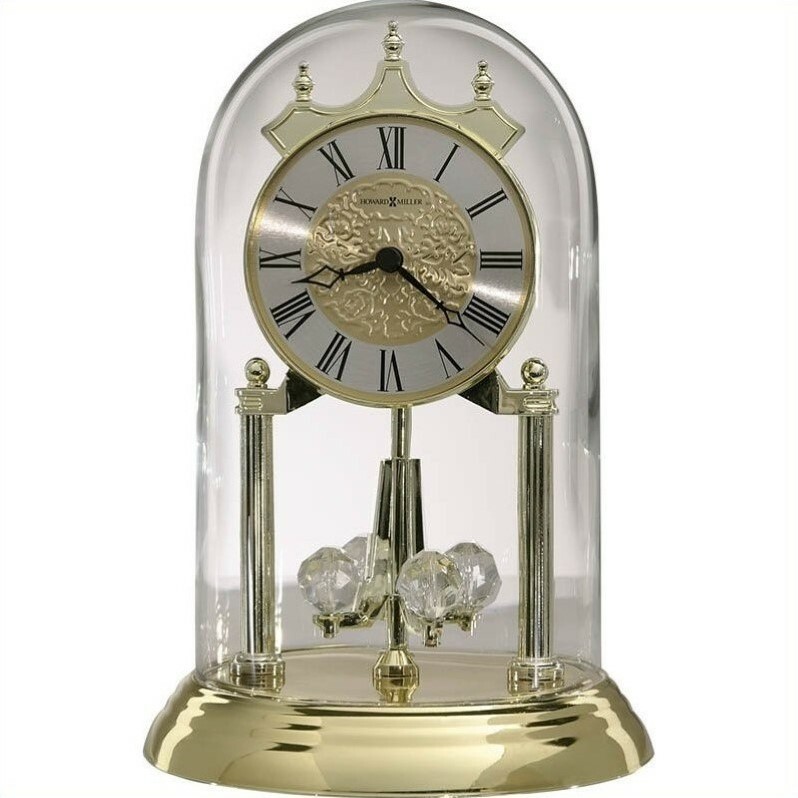 A quest for perfection The Christina Table Alarm Clock by Howard Miller is a Polished brass finished 9 glass-domed anniversary clock with metal base and triple crown finial. A two-toned satin brass dial features a circular spun silver, numeral ring with raised, embossed center design and black Roman numerals, surrounded by a brass-tone bezel; Black, open fret cut diamond hour and minute hands; The direct-drive pendulum includes four revolving synthetic crystals; Quartz, alarm movement includes the battery; Made in the United States of America . Specifications: Dimensions: 22.25H x 5.25D x 10W; Carton Dimensions: 7.25H x 11D x 7.25W; Weight: 2.1 pounds . America's most beloved Halloween special comes to life with the PEANUTS&#153; characters in a enchanting 50th anniversary clock. Now, relive this beloved classic time and again with the PEANUTS Halloween Party Cuckoo Clock, an officially licensed limited edition exclusively from The Bradford Exchange. This PEANUTS Halloween clock is custom crafted, intricately hand painted and features eight PEANUTS characters, including Snoopy, Charlie Brown, Woodstock, Linus and Lucy - all celebrating Halloween in front of Snoopy's leaf-covered doghouse whilst awaiting the Great Pumpkin. And who sits on top of this Snoopy cuckoo clock? Snoopy himself, dressed in costume.LED lights illuminate Charlie Brown and the jack-o-lantern front and center. At the top of each hour, Woodstock plays cuckoo and emerges to the PEANUTS theme "Linus and Lucy". The golden clock face is accented with the PEANUTS logo and is powered by a precision quartz movement to keep ideal time. A golden metal pendulum swings to and fro and is inscribed with "Happy Halloween" as an added festive touch. Measuring virtually a foot and a half high, the PEANUTS Halloween Party Cuckoo Clock is a must-have for any PEANUTS fan. Strong demand is expected. So, don't waste any time - order now! Always know the position of the tide and times of high and low seas with a useful and atractive Tidal Clock, including a lovely Brass Tide Clock selection and beautifully crafted Howard Miller Tide Clocks. Personalized Anniversary Clocks. Anniversary Clock Kits. Seiko Anniversary Clocks. Anniversary Clocks for UK Delivery. If you'd like something different why not add some magic to your home with Harry Potter Clocks featured at Broomsticks And Owls. Please bookmark Piglette for anniversary clocks plus a wide range of flowers and gifts for all occasions.